I’ve been to Vegas more times than I can remember. It’s always been a decent weekend getaway destination and is a good place to meet up with friends as it’s easily accessible, has reasonably priced accommodation and great restaurants. And if you want you can explore the desert, catch a live show, gamble, or go to a night club. I’m not much of a gambler or a nightclub guy, but I do like to visit an interesting museum. 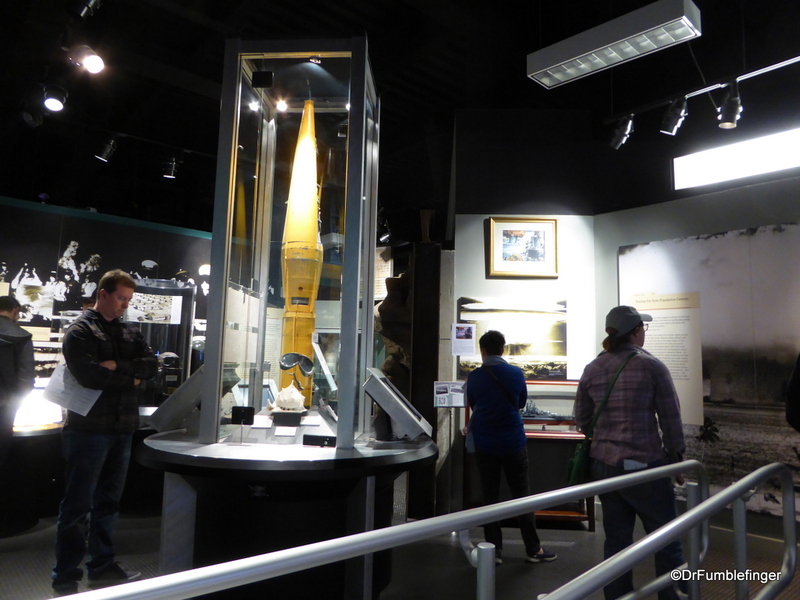 The National Atomic Testing Museum (NATM) certainly is different than most and if you have an interest in science and military history, is well worth a visit. The museum opened in 2005 and is operated by the Nevada Test Site Historical Foundation. It’s affiliated with Washington DC’s prestigious Smithsonian Institution. Few things in man’s history are as fascinating and as frightening as the development of atomic weapons. Hitler was big on the idea of developing a superweapon and during WWII there were rumors the Nazis were working on one, which catalyzed the Manhattan project and the successful design, construction, testing and use of an atomic weapons by the United States. This history is well known and covered at the NATM. The museum’s main focus is on the period from the first atomic bomb detonations at the Nevada Test Site in 1951 to the present. NATM shares the story of the many atomic bomb tests that were conducted at the Nevada Test Site in the desert north of Las Vegas. Many of these were above ground detonations (like the one in the photo below), but in later years most were below ground detonations resulting in the pox-marked landscape you now see at Yucca Flat. The crater-shaped holes are due to underground explosions’ vaporizing matter, causing the ground to implode after detonation. 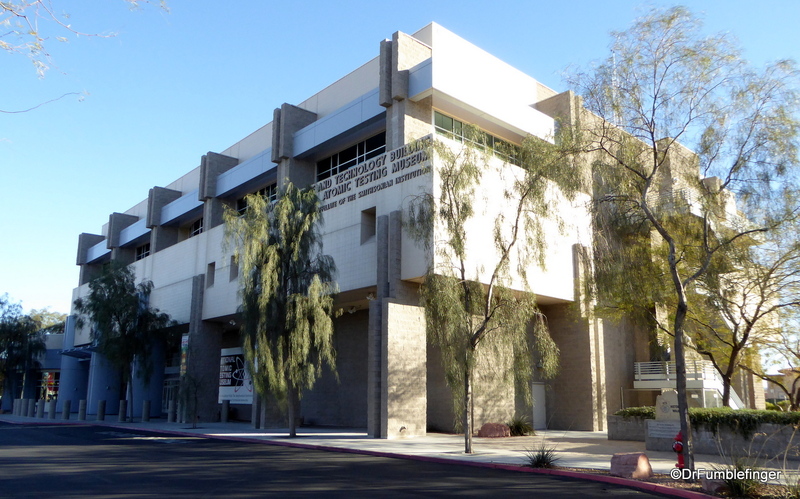 The museum has many exhibits from that era including an old office from the Nevada Test site, scientific and lay literature and propaganda on the subject, a nuclear fall-out shelter, and even the Ground Zero Theater which simulates an above ground atomic explosion up close. The Theater is an unusual experience. While watching a short movie clip of an bomb detonation, the place starts shaking and roars with the detonation — quite an interesting sensory experience. The museum discusses the evolution of the atomic weapons program, geopolitical aspects of nuclear testing, and a wide array of displays ranging from Geiger counters to a portion of the Berlin Wall (symbolizing the end of the Cold War). In 2012 the museum added an exhibit about Area 51, and expanded the exhibit two years later. There are over 3500 artefacts displayed in 8,000 square feet of exhibit space and you’ll need a half day to explore it all. The display is on the lower floor of the building. The upper stories house government documents and photos of atomic history. 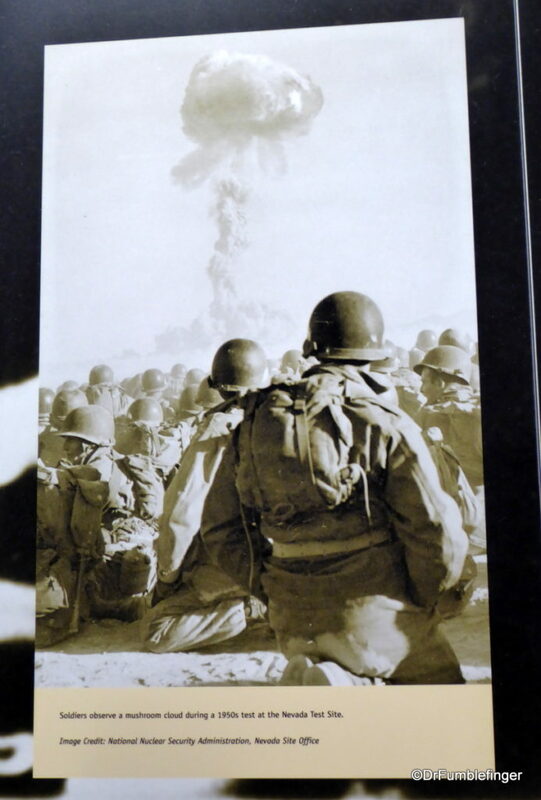 There is also a library that includes a large collection of books and DVDs about atomic testing. The museum is located in Las Vegas, Nevada, at 755 E. Flamingo Rd., just north of McCarran International Airport and east of the Las Vegas Strip. There is ample parking. Good stuff Good Doctor! We miss you – hope the fam is well! Thanks for the note, Jeremy. I’m in Spokane almost half time now, so let’s plan on getting together sometime in 2019. Would be nice to catch up with you and the family.